In this 22nd post of The BBX Investigation I use six examples of barter exchange failures to describe the process and reasons for failure. The BBX Investigation has shown a barter business in demise. All metrics and evidence points to a cash-strapped business spinning out of control with management simply incapable of and unable unable to stop the rot. My expose has resulted in a series of dents in the remaining shell of an empire established by a dynamic and capable businessman that must be (and indeed are) the final nails in a coffin. Human nature being what it is, BBX personnel will attempt to keep up the facade as long as possible, even though the ship is sinking, they will attempt to ride it out, “We’ll take the knocks, and recover!” is the kind of thing that will be going through the minds of staff and management. We saw this with conman Daniel Evans who carried on merrily with his deceptions until day that The Ormita Report came out. Even then when the writing was clearly on the wall, he desperately attempted to discredit the messenger and managed only three weeks more before it was all over. The same thing occurred with the Qoin conmen Rob van Hilten & Edgar Kampers. Even though they had conned the world for decades and their Tradeqoin fraud was exposed for what it was, they still kept at it, indeed for some two years before the inevitable bankruptcy occurred. Qoin was a little different though because they had the active support of IRTA during this time, thus they were able to keep the con going a little longer than they should have, by rights. As BBX goes down in the light of damning and accurate exposure such as this, it is exactly the same process – the bad guys do bad things, misrepresenting reality for nefarious purposes; the lights come on and there is shock and awe as they realise that there is trouble afoot; Someone is raining on their parade. They freeze, like possums in the glare of the headlights; then one by one the cockroaches flee, leaving only the fools and perpetrators who are left alone and exposed, abandoned by those who scramble to safety, to lick their wounds and [for some] hope like h*ll that the authorities never knock on their door having found out about their complicity in what have been (in BBX’s case) very serious white-collar crimes. The true nature of people comes out under stress. In wartime you get the real story best exemplified by the observations put to me once by an old soldier, “There ain’t no atheists in the trenches!” The nasty vindictive ones will lash out. The deceivers will attempt to deceive even more then scurry away into the darkness when the game is up. Watch out for all the dirty tricks in the book from the dirty ones, and the ones who stood by and supported the game as long as they could (the likes of BBX members in credit, staff who hung in there, IRTA and the last remaining Franchisees) will be seen for the opportunists that they were. Understanding how this all works helps us to understand what is happening in the BBX ranks – I hear that one of the Touma girls is in Thailand attempting to prop up the BBX name. She has, according to what I have heard done all sorts of desperate crazy things to attempt to put lipstick on a very sick pig. To the discerning this is all just more evidence of reality. I’ve already published [only one hour after receiving it] what I consider a feeble effort at a cease and desist letter from BBX’s CEO Carolin MacDonald which I roasted as nothing more than amateur’s brain-fart. Threatening me with court action is an own-goal by all accounts; total, utter and complete foolishness in my case as I’d absolutely LOVE to get my evidence of BBX crimes into a court of law and on the record! It would be like threatening to put a randy sailor into a harem of nymphomaniacs threatening me with defamation and legal action. “Stop doing that or . . . ” These are not the actions of people who have a proper understanding of their place in the world with any dollop of sincerity. The actions of BBX management prove that they are simply away with the fairies; no grasp of reality; brought up in la-la-land where they were taught from a young age by example that if you BS enough, then you can have anything you want. More, more, more . . .
At the time of writing, both Bartercard and BBX are technically still operating but they are in the advanced stage of demise, so I include them as examples. New Zealand Barter operated successfully for years. Ahead of the curve, it’s demise actually came before the commercial barter industry had its growth and heyday. It set an excellent example though, of the consequences of a currency debasement, where the owner had built the business, helped himself and his colleagues (as I understand it) to the real goods and services, and when his health failed, left the mess to one guy who kept the fires burning as long as he could. On his departure it ceased operations with most members losing their various credits in the system. It was a long slow protracted death where all members in credit still stayed a member in the vain hope of getting something back, someday. They never did. The founder of Ozone was the conman of Ormita infamy, Daniel Evans. He launched the exchange in direct opposition to Bartercard; targeted their database and was quite successful. There was a vibrancy and excitement within the membership in the early days as Daniel stoked the fires of resentment against Bartercard’s dominance and arrogance. Traders loved the ultra-low fees, promises of international growth and more. Daniel built the business well, brought in investors and then on one fateful day – BANG. It was all over. Investigations found the trade ledger (which should normally sit at 50:50) sitting at 100:0. Daniel had gotten EVERY member into trade credit, nobody was had any trade debit. All involved lost everything. Daniel got it all! While this was a little unusual as far as Trade Exchanges go – an outright fraud, the principle of failure was the same – a debased currency through theft by the currency owner. Ormita was an international fraud established by the same conman Daniel Evans following the demise of Ozone. My six-month investigation into Ormita resulted in the publication and distribution of The Ormita Report throughout the industry by IRTA (thank you guys). While again a little different from your traditional barter exchange that actually has real members and trading, Ormita was a shell operated by essentially one man with a couple of boys who lived, travelled, ate, slept and played with the conman. Presenting themselves as a huge international trading platform with massive rapid growth into many countries, they were of course, simply names in a database, a little like the BBX UK operations and also similar to the fake BBX China thing. Promotional packages, friend bring friend and a scraping exercise loading large numbers of businesses who in many cases didn’t even know that they were in the system! Again, when the game was over, Daniel slunk off into the darkness. While it was a fraud that seriously impacted IRTA and the people there, in the whole scheme of things, Ormita was only a little blot on the barter landscape, a lot of noise and wild claims but no really big losses to the business community. The biggest losses were all the franchisees who learned that their investment was lost to a conman. Except for those that franchisees brought in from existing exchanges, there were very little members and certainly no trading. The Qoin Con DID cause huge losses but this was primarily to the EU funding agencies and Symbid investors. Not really that much to the business community. Again we can see a repeating pattern with my investigations into Tradeqoin where I established that membership was actually 6% of that claimed. Deception often revolves around claims of membership numbers which is why BBX UK’s current campaign that knowingly and falsely claims wild numbers and across the globe, is so alarming. Tradeqoin’s turnover was non existent as Qoin’s business model was to secure public (or semi-public funding) basing their presentations on knowing who-was-who in the funding world; talking big and then pocketing the bulk of their income for lifestyle and personal enrichment. My damning exposure in realtime in January 2016 brought an end to the Tradeqoin exchange with bankruptcy currently in excess of E500k. The BBX Inestigation may stop BBX UK in its tracks with early exposure, we will have to wait and see whether they clean up their act or go down with the ship, but the truth is out there nonetheless. While still trading and talking big, Bartercard is another barter trade exchange in serious decline. Over the last decade or so, real membership has taken a massive dive, as has profitability and indeed everything measurable. One thing that hasn’t changed however is the conduct and ethics of the management – spin. Their recent IPO saved their day, literally. Stitching up a pre-launch sweetheart deal with a superannuation fund by back-room deals, the relatively new owners (who I call “smiles in suits”) got their desperately need cash to prop themselves up. They have brought all but (I think) one Franchise back into their own fold as they desperately milk every last cent they can from what is left of what was at one stage (certainly looking from the outside) Wayne Sharpe’s quite impressive empire. Bartercard’s key secret is their capacity and skill in concealing debt. Their massive hidden debt is their Achilles Heel, and as knowledge of this currency debasement gets out, confidence will drop, no matter what the puppetmeisters say or do. Exposing the true debasement of the currency causes loss of confidence in that currency and then the rest is simply inevitable. We come now to the focus of this investigation. The Founder of BBX was essentially an opportunist. A lovely guy, salesman extraordinaire, with huge amounts of passion and commitment, he built a family business that appeared to be based on (as one industry player says of Michael Touma in an obituary), “a man of integrity and passion like no other I have seen before him”. Source The reality however was a little different as serious currency debasement has occurred, and with his health issues and subsequent death, the wheels have fallen off and the truth is getting out there. The ultimate nail in the coffin is that with exposure of reality within the BBX currency, death is inevitable. Excepting outright cons where there is no real members and no real currency (like Ormita and Qoin), the root cause of all barter exchange deaths is currency debasement. It was with the above examples, NZ Barter a gradual demise that petered out; with Ozone a spectacular instant event; with Bartercard (and many other struggling barter exchanges) a gradual downturn in the business environment and inability of members to spend effectively. Again, with BBX, a decline following years of dodgy deals at the members’ expense. I repeat this for it is VITAL to understanding the position that barter exchanges in trouble are actually in . . . it is currency debasement; the devaluing of the trade currency; the inflation; always caused by real value disappearing from the trading system (membership) that locks a barter exchange up so that trading becomes harder and harder, confidence falls, eventually cash incomes fall for the owners, staff are laid off, franchises fold or run, the owners step in to attempt to prop things up but eventually it’s all over Rover! Now in each of the above examples the final bullet that killed; the straw that broke the camel’s back was different. The process was the same, but the CAUSE of the final death was different. In the case of NZ Barter it was the last man standing. When he left, the last guy (Steve, who I knew well) who had tried desperately to keep people trading, doing deals to pay his own wages, watching it get harder and harder . . . when he left, that was it. In the case of Ozone it was a surprise raid on Daniel’s office by his Indian business partner/investor. They booted him off the company, charged into his office at night, locked the doors and poured over the conman’s lair literally – yes it was spectacular, and very sobering for the lot of them as they found out piece by piece from the actual evidence what had really happened. In the case of Ormita, it wasn’t the report I published that did the real damage. Oh sure, the entire industry knew the facts and to be frank were pretty much stunned by it all, but it was one key event, only three weeks after The Ormita Report came out that killed off Daniel Evans’ fraud once and for all . . . the termination of his servers by David Polo, the Spanish guy who tried against all hope to extricate himself from his partnership with the conman. The reason that David finally after three weeks of pain pulled the plug was that he was the last man standing. All others had abandoned the sinking ship, leaving just one man keeping up appearances. By listing all those associated [essentially naming and shaming them in public] David had no choice but to either go down with the ship or jump. He jumped. The public naming and shaming of supporters in realtime, showing each supporter pulling out one by one over a period of three weeks put unbearable pressure on the core Ormita systems and was the cause of the death. Daniel had no backup of the Ormita platform source code, couldn’t keep up the con and disappeared into the ether. In the case of the Tradeqoin fraud and Qoin itself it was a Twitter campaign. Nobody knows this yet, but the real nail that put the end to the Qoin conmen’s crimes wasn’t the inside knowledge that I had in realtime, nor the incredibly accurate damning blogging, again in realtime that caused their bankruptcy, it was actually a very short and effective targeted Twitter campaign that I established promoting the book The Qoin Con a long time (weeks) before. The reason this was so effective was that the Achilles Heel of the Qoin conmen (which was the core of their business) was their source of funding. Simply letting it be known to key people within the close-knit Netherlands funding agencies that the book was coming out [and of course hinting that their reputations could be tarnished by association] was enough for the Qoin conmen’s presentations of grandeur to be questioned, and the source of the funding dried up. Bartercard is still alive and kicking, although petrified that knowledge of their hidden trade deficit will get out. It’s all a confidence game after all. If they are seen to be crooked (and they are with a massive undisclosed trade deficit in the hundreds of millions) then they know the consequences when confidence takes a hit. My book Bartercard SECRETS will not be the final nail in the coffin, but it will hasten their demise. I know what the actual bullet looks like with the Bartercard demise and will share the actual cause of their inevitable death closer to the time. BBX’s last breath will come from one reason only. Yes, there will re reduced confidence in the BBX trade dollar which will affect trade volume and cash income from fees. That won’t be the cause of death though. Yes, there will be inevitable staff layoffs and franchisees pulling out to save what they can. Again, that won’t be the cause though. Sure, some will stay in the BBX system for as long as they can. Sure, some rich funders may come to the party and help the girls out. Maybe the BBX management can rally the troops and keep the BBX corpse breathing a little while but the bullet that I believe will bring the operations to a close will be the banks. 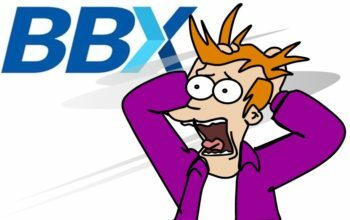 When the banks complete their process of investigating the clear, ultra-serious breach of critical financial data security process (of some 88,000 cardholders as BBX claims) then they will take action to protect their interests and I predict that this action will be terminal for the BBX exchange. I’ve explained this process already, first, Mastercard, VISA and others will pull the plug on their connectivity, then as word gets out in the financial industry that BBX has problematic systems and a recalcitrant management, others too will pull the plug. No longer able to receive fees via credit cards, BBX management will resort to Paypal, cheques, cash and one by one this will trigger irreversible events. Paypal will notice a spike in traffic, close or suspend their account, cheques will bounce and people will ask why they have to take in cash to their bank, even the banks themselves will get titchy with loans, overdrafts even any accounts in credit will have serious attention drawn on them. I predict that it will be the banks and their losing of credit card facilities that will be the final bullet that BBX will never recover from. Criminal investigations will simply mop up after the crash – they are unlikely to be the cause. BBX International management has committed multiple crimes in multiple jurisdictions [only some of which I have spoken of here] and NOBODY is above the law – NOBODY. BBX is a dead man walking. In my next post I detail the various roles that the BBX people played, and give my take on the ethics and morality of the various players. It is not a pretty picture for some and brutal honesty can hurt, I put myself in there as well and grill the investigating blogger! Standby . . . we’re nearing the end of The BBX Investigation. In my experience [Holocaust] Revisionists tend to be guided by material … rational argument & logic, whereas Holo[caust]-believers go more by stories, which they have been told.